Amnesty International is highlighting the work of a number of activists who have been persecuted or even murdered for their work defending the Earth. 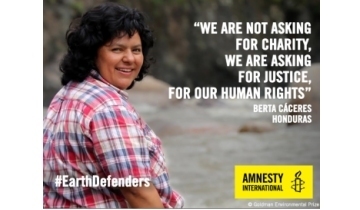 Berta Cáceres Flores, was an activist for the rights of the indigenous Lenca Peoples and the protection of the environment. She was coordinator for the Civic Council of Popular and Indigenous Organizations of Honduras, COPINH. In March 2016, Berta was murdered in her home in Intibucá, Honduras. Ildefonso Zamora Baldomero is an indigenous Tlahuica and rural inhabitant of the San Juan Atzingo community in Mexico State, Mexico. For over 20 years, Ildefonso has worked to protect the Great Water Forest threatened by illegal logging. As a result of his work in defense of the forest, Ildefonso has been subject to harassment, threats and attacks and has now been in prison for 7 months on baseless charges. Máxima Acuña is a female farmer from Cajamarca, northern Peru. Máxima and her family are locked in a legal battle with the Yanacocha mining project over ownership of the land on which she lives with her family. The company has accused Máxima of occupying the land, upon which the company planned to expand its mining activities in the region. For years, Máxima and her family have been subject to intimidation and surveillance by state security forces and private security guards. Amnesty International is calling upon Peruvian authorities to protect Máxima and her family, ensure respect for their human rights, and publicly acknowledge her legitimate work as human rights defender.